Budh Ashtami is an auspicious day for Hindu devotees that occurs when the ‘Ashtami’ tithi (8th day) falls on a Wednesday or ‘Budhwar’ in the traditional Hindu lunar calendar. Budh Ashtami can either occur during the ‘Shukla Paksha’ (the bright fortnight of moon) or during the ‘Krishna Paksha’ (the dark fortnight of moon) in a month. On this day, devotees worship Lord Shiva and Goddess Parvati with full devotion and dedication. According to the Hindu legends it is believed that one, who keeps a fast on the day of Budh Ashtami, never goes to Hell, after death. Hindu devotees also observe the Budh Ashtami Vrat to seek the divine blessings for prosperity and wellbeing in their lives. 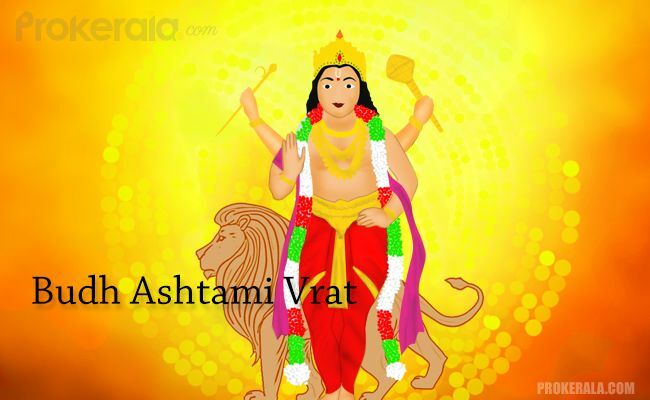 Budh Ashtami Vrat is popularly observed in Gujarat, Maharashtra and northern states of India. On the day of Budh Ashtami Vrat, devotees worship Budha Graha and ask for His blessings. Most of the devotees keep a fast on this day. Special ‘Naivedya’ is prepared and offered to Lord Budha. The observer of the Budh Ashtami Vrat can only eat this Prasad after finishing the puja rituals. Devotees worship Lord Budha idol or his picture inscribed on the gold or silver coin. A ‘kalash’ filled with water is kept at the place of worship and an unpeeled green coconut is placed atop. Several rituals are then performed and people pray to appease Lord Budha with full love and affection. After puja, the ‘Naivedya’ is eaten and distributed among other devotees. The Budh Ashtami Vrat must be performed 8 times continuously every year. In the final year, the gold or silver coin with the picture of Lord Budha is given away to a Brahmin. The observer of Budh Ashtami Vrat gains freedom from all his/her sins and also escapes from going to hell. In some places, Lord Shiva and Goddess Parvati are also worshipped on the day of Budh Ashtami. The untold glories of Budh Ashtami Vrat are stated in ‘Brahmanda Purana’ and other Hindu religious scriptures. It is a strong belief that the observer of the Budh Ashtami Vrat gains freedom from all his/her sins. Even the sins from pervious births are also redeemed by worshipping Lord Shiva and Parvati on this day with utmost fervour and zeal. The Budh Ashtami Vrat is also observed by those people inflicted with ‘Budh Grah Dosham’ as the outcome of puja and fasting on this day, pacifies the ill-effects of Budh Grah on the future.